in the U.S., with 16,000 stores in 39 states. @LoyalTubist - Thanks for the note on A&P's demise; I've updated the item description accordingly. 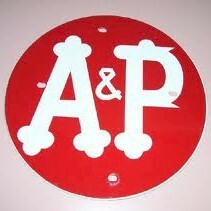 My Papa was a butcher at A&P stores. And we use to shop there when I was a kid. I see this sign and think of my dad, who is no longer with us. It's just now a memory of the past, but a good one. How many of you know A&P went out of business in late 2015? My dad was a butcher and worked at A&P stores in Kansas City. I seen this logo and all I could think of was been a kid again, and my Dad. In the mid 60's, I used to go grocery shopping with my dad, at the A&P on Victory Blvd. in Van Nuys, CA. But, while my dad was shopping, I would ride my skateboard around the shopping center. Hated to leave, couldn't wait for next time.